Style beyond compare. 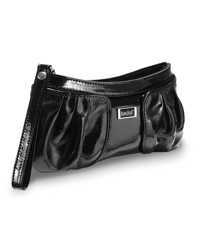 This Bedol signature soft black patent leather wristlet is the perfect size to carry your evening out essentials. Composed of top grain leather, the Bedol wristlet features a zippered top and hand strap making this the perfect accessory for the style and image conscious. What’s next? Rounding up the girls and letting the night come to you!